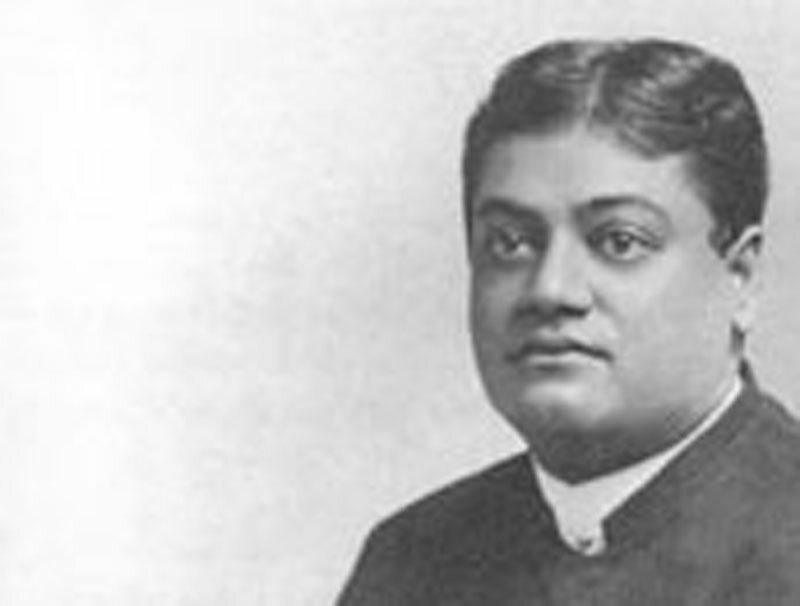 [At the end of August 1893, Swami Vivekananda stayed at Annisquam at the house of Prof. J. H. Wright. So astonishing a sight did Swamiji present in this quiet little New England village that speculations set in at once as to who this majestic and colourful figure might be. From where had he come? At first they decided that he was a Brahmin from India, but his manners did not fully conform to their ideas.] It was something that needed explanation and they unanimously repaired to the cottage after supper, to hear this strange new discourse. . . .
"It was the other day," he said, in his musical voice, "only just the other day — not more than four hundred years ago." And then followed tales of cruelty and oppression, of a patient race and a suffering people, and of a judgment to come! "Ah, the English!" he said. "Only just a little while ago they were savages, the vermin crawled on the ladies' bodies, . . . and they scented themselves to disguise the abominable odour of their persons. . . . Most hor-r-ible! Even now they are barely emerging from barbarism." "Nonsense," said one of his scandalised hearers, "that was at least five hundred years ago." "And did I not say 'a little while ago'? What are a few hundred years when you look at the antiquity of the human soul?" Then with a turn of tone, quite reasonable and gentle, "They are quite savage", he said. "The frightful cold, the want and privation of their northern climate", going on more quickly and warmly, "has made them wild. They only think to kill. . . . Where is their religion? They take the name of that Holy One, they claim to love their fellowmen, they civilise — by Christianity! — No! It is their hunger that has civilised them, not their God. The love of man is on their lips, in their hearts there is nothing but evil and every violence. 'I love you my brother, I love you!' . . . and all the while they cut his throat! Their hands are red with blood." . . . Then, going on more slowly, his beautiful voice deepening till it sounded like a bell, "But the judgment of God will fall upon them. 'Vengeance is mine; I will repay, saith the Lord', and destruction is coming. What are your Christians? Not one third of the world. Look at those Chinese, millions of them. They are the vengeance of God that will light upon you. There will be another invasion of the Huns", adding, with a little chuckle, "they will sweep over Europe, they will not leave one stone standing upon another. Men, women, children, all will go and the dark ages will come again." His voice was indescribably sad and pitiful; then suddenly and flippantly, dropping the seer, "Me — I don't care! The world will rise up better from it, but it is coming. The vengeance of God, it is coming soon." "It will not be a thousand years before it is done." They drew a breath of relief. It did not seem imminent. "And God will have vengeance", he went on. "You may not see it in religion, you may not see it in politics, but you must see it in history, and as it has been; it will come to pass. If you grind down the people, you will suffer. We in India are suffering the vengeance of God. Look upon these things. They ground down those poor people for their own wealth, they heard not the voice of distress, they ate from gold and silver when the people cried for bread, and the Mohammedans came upon them slaughtering and killing: slaughtering and killing they overran them. India has been conquered again and again for years, and last and worst of all came the Englishman. You look about India, what has the Hindu left? Wonderful temples, everywhere. What has the Mohammedan left? Beautiful palaces. What has the Englishman left? Nothing but mounds of broken brandy bottles! And God has had no mercy upon my people because they had no mercy. By their cruelty they degraded the populace; and when they needed them, the common people had no strength to give for their aid. If man cannot believe in the Vengeance of God, he certainly cannot deny the Vengeance of History. And it will come upon the English; they have their heels on our necks, they have sucked the last drop of our blood for their own pleasures, they have carried away with them millions of our money, while our people have starved by villages and provinces. And now the Chinaman is the vengeance that will fall upon them; if the Chinese rose today and swept the English into the sea, as they well deserve, it would be no more than justice." And then, having said his say, the Swami was silent. A babble of thin-voiced chatter rose about him, to which he listened, apparently unheeding. Occasionally he cast his eye up to the roof and repeated softly, "Shiva! Shiva!" and the little company, shaken and disturbed by the current of powerful feelings and vindictive passion which seemed to be flowing like molten lava beneath the silent surface of this strange being, broke up, perturbed. He stayed days [actually it was only a long weekend]. . . . All through, his discourses abounded in picturesque illustrations and beautiful legends. . . .
One beautiful story he told was of a man whose wife reproached him with his troubles, reviled him because of the success of others, and recounted to him all his failures. "Is this what your God has done for you", she said to him, "after you have served Him so many years?" Then the man answered, "Am I a trader in religion? Look at the mountain. What does it do for me, or what have I done for it? And yet I love it because I am so made that I love the beautiful. Thus I love God." . . . There was another story he told of a king who offered a gift to a Rishi. The Rishi refused, but the king insisted and begged that he would come with him. When they came to the palace, he heard the king praying, and the king begged for wealth, for power, for length of days from God. The Rishi listened, wondering, until at last he picked up his mat and started away. Then the king opened his eyes from his prayers and saw him. "Why are you going?" he said. "You have not asked for your gift." "I", said the Rishi, "ask from a beggar?" Often on Swamiji's lips was the phrase, "They would not dare to do this to a monk." . . . At times he even expressed a great longing that the English government would take him and shoot him. "It would be the first nail in their coffin", he would say, with a little gleam of his white teeth. "and my death would run through the land like wild fire." His great heroine was the dreadful [?] Ranee of the Indian mutiny, who led her troops in person. Most of the old mutineers, he said, had become monks in order to hide themselves, and this accounted very well for the dangerous quality of the monks' opinions. There was one man of them who had lost four sons and could speak of them with composure, but whenever he mentioned the Ranee, he would weep, with tears streaming down his face. "That woman was a goddess", he said, "a devi. When overcome, she fell on her sword and died like a man." It was strange to hear the other side of the Indian mutiny, when you would never believe that there was another side to it, and to be assured that a Hindu could not possibly kill a woman. . . .